New Zealand nationality law determines who is and who is not a New Zealand citizen. The status of New Zealand citizenship was created on 1 January 1949 by the British Nationality and New Zealand Citizenship Act 1948. Prior to this date, New Zealanders were only British subjects and New Zealand had the same nationality legislation as the United Kingdom and other Commonwealth countries (see also British nationality law). The 1948 legislation was replaced by the Citizenship Act 1977, which came into force on 1 January 1978. This was substantially amended in 2005 by the Citizenship (Amendment) Act 2005, in force from 21 April 2005. The Citizenship Office of the Department of Internal Affairs is in charge of processing applications and enquiries relating to New Zealand citizenship. In the mid-19th century, all 'aliens' (i.e. non-British subjects) were able to enter and live freely in the British Queen’s dominions (including New Zealand), although their property rights were restricted. French and German settlers complained about their inability to acquire property in New Zealand, and so, from 1844, aliens in New Zealand were able to become ‘natural born subjects of Her Majesty [Queen Victoria]’ through proclamations by the governor (which would later be confirmed by ordinances). On 1 January 1978, the Citizenship Act 1977 came into force. New Zealand passports no longer contained the status of 'British subject and New Zealand citizen', but instead only stated 'New Zealand citizen'. Foreign nationals who wanted to become New Zealand citizens were no longer naturalised, but rather received New Zealand citizenship by grant. Māori were granted ‘all the Rights and Privileges of British Subjects’ under Article 3 of the Treaty of Waitangi in 1840. Their status as British subjects was re-affirmed by the Native Rights Act 1865. However, despite their legal status as British subjects, in practice, over the next century, Māori would be denied some of the privileges which white British subjects who moved to New Zealand from Britain enjoyed. When the Cook Islands and Niue became New Zealand territories in 1901, their inhabitants were already British subjects. In 1920, Tokelauans became recognised as British subjects. In 1920, New Zealand started governing Western Samoa under a mandate from the League of Nations. The 1923 and 1928 British Nationality and Status of Aliens Acts passed by the Parliament of New Zealand allowed for Western Samoans to be naturalised as British subjects and they were exempted from the usual requirement to understand and speak English. When the British Nationality and New Zealand Citizenship Act 1948 came into effect on 1 January 1949, Cook Islanders, Niueans, Tokelauans and Western Samoans who were British subjects gained New Zealand citizenship. When Western Samoa achieved independence from New Zealand in 1962, the citizenship status of Western Samoans living in New Zealand became uncertain. As a result, many Western Samoans were staying in New Zealand illegally. On 28 July 1982, following a stiff tightening of Pacific Island immigration by the Muldoon government, the Privy Council ruled that because of the 1923 and 1928 British Nationality and Status of Aliens Acts, all Samoans born between 1924 and 1948 – and their children – were British subjects and hence, on 1 January 1949, had become New Zealand citizens. The Privy Council ruling would have meant recognising over 100,000 Samoans as New Zealand citizens. Because the New Zealand Government was unwilling to grant New Zealand citizenship to such a large number of people, the Parliament of New Zealand passed the Citizenship (Western Samoa) Act 1982 which overrode the Privy Council ruling. Under this new law, Samoan citizens who were in New Zealand at any point on 14 September 1982 (legally or illegally) or arrived in New Zealand as permanent residents after that date were eligible to be granted New Zealand citizenship, but other Samoans born before 1949 and their children were not. This law has been controversial. A 2003 petition asking the Parliament of New Zealand to repeal the Act attracted 100,000 signatures, and the Samoan rights group Mau Sitiseni filed a petition on the issue with the United Nations Human Rights Committee in 2007. In 1866, the Aliens Act imposed a naturalisation fee of £1 on all immigrants to New Zealand who were perceived to be 'undesirable', which in effect meant most non-white immigrants. When this naturalisation fee was abolished in the 1890s, Chinese people continued to be discriminated against as they still had to pay the fee whilst all other applicants did not. In 1908, Chinese people in New Zealand were subjected to even more discrimination. They were denied any possibility for permanent residence and citizenship and were required to apply periodically for permission to remain in New Zealand. Despite being treated as third-class citizens, during the Second World War, Chinese people in New Zealand were forced to serve in the armed forces. It was not until 1951 that Chinese people were finally allowed by law to apply for permanent residence and citizenship again. However, in practice, they continued to be subject to discrimination. Out of the first 400 applicants who fulfilled the legal requirements for New Zealand citizenship and hence who applied for naturalisation, only 20 applicants who were deemed to be 'the most highly assimilated [and educated] types' were approved. In addition, whilst all other applicants for New Zealand citizenship did not have to renounce their former nationality, Chinese people were required to renounce their Chinese citizenship and to demonstrate that they were ‘closer to the New Zealand way of life than to the Chinese'. On 12 February 2002, Prime Minister Helen Clark made a formal apology in Parliament to the Chinese community in New Zealand for the discrimination which they had faced in the past. In her speech, she acknowledged the 'unacceptable indignity' suffered by Chinese people in New Zealand as a result of 'discriminatory laws' passed by Parliament in the past relating to immigration and citizenship which applied to no other ethnic group. As Commonwealth citizens, New Zealanders are afforded a number of privileges in some Commonwealth countries. In many Commonwealth countries in the Caribbean, such as Belize and Trinidad and Tobago, New Zealand citizens who are long-term residents have the right to vote in elections. New Zealand citizens who require consular assistance in a foreign country where there is no New Zealand foreign mission may be able to request assistance from a British embassy, high commission or consulate. For example, New Zealanders who need to travel urgently and whose passport has expired, been lost or been stolen can be issued with an emergency travel document by a British foreign mission as long as this has cleared with the New Zealand Ministry of Foreign Affairs and Trade. New Zealand citizens travelling on a New Zealand passport enjoy the privilege of visa-free access to 172 countries and territories around the world, including the United States and all European Union member states according to the Henley visa restrictions index. In recognition of the fact that foreign nationals (including Portuguese citizens) who are permanent residents are allowed to vote in elections in New Zealand, since 2013 Portugal has allowed New Zealand citizens aged 18 or over residing there to enrol at the Comissão Recenseadora and vote (though only in local elections). At present, New Zealand is the only country outside the European Union, the Community of Portuguese Language Countries and Latin America whose citizens are entitled to vote in Portugal. By grant: Either by fulfilling the general requirements or by qualifying for a special grant (e.g. as the child of a New Zealand citizen or as a qualifying Samoan citizen). For the purpose of acquiring citizenship, the Cook Islands, Niue, the Ross Dependency and Tokelau are treated as part of New Zealand – hence, for example, a child born in Tokelau to a Tokelauan permanent resident would qualify for New Zealand citizenship. However, for Samoan citizens applying for a special grant of New Zealand citizenship, the Cook Islands, Niue, the Ross Dependency and Tokelau are not treated as part of New Zealand. For the purpose of passing on New Zealand citizenship to children born outside New Zealand, all such persons are New Zealand citizens by descent. Similarly, all persons born or naturalised in New Zealand in 1949 or later are New Zealand citizens 'otherwise than by descent'. Children born in New Zealand (or on board a ship or aircraft registered in New Zealand) on or after 1 January 2006 will acquire New Zealand citizenship by birth only if at least one parent is a New Zealand citizen or permanent resident (including Australian citizens). Children born to a parent who is a permanent resident of the Cook Islands, Niue or Tokelau also qualify. If a person is not a New Zealand citizen by birth, but is subsequently adopted in New Zealand by an adoption order under the terms of the Adoption Act 1955 on or after 1 January 2006 by a person entitled to reside indefinitely in New Zealand (i.e. a New Zealand citizen or permanent resident, an Australian citizen or permanent resident), the Cook Islands, Niue or Tokelau), the person becomes a New Zealand citizen. The post-adoptive birth register entry will record that the person is a New Zealand citizen. A person who is a New Zealand citizen by birth is a New Zealand otherwise than by descent, which means that they can pass New Zealand citizenship on to their children born overseas. In order to claim their New Zealand citizenship, these people must register their citizenship by descent at the Citizenship Office. A person born or adopted outside New Zealand between 1949 and 1977 with a mother who is a New Zealand citizen otherwise than by descent at the time of birth or the final adoption order is entitled to apply for a grant of New Zealand citizenship as of right (see below), rather than New Zealand citizenship by descent. A person born to or adopted by a parent outside New Zealand who, at the time of birth or the final adoption order, was a New Zealand citizen (by descent or otherwise than by descent) working overseas for the public service or Armed Forces of New Zealand, the Cook Islands, Niue or Tokelau is considered to be a New Zealand citizen otherwise than by descent, rather than by descent. If the child of a New Zealand citizen by descent born or adopted overseas does not qualify to register as a New Zealand citizen, they can be brought to live in New Zealand and subsequently granted New Zealand citizenship (see below). New Zealand citizens by descent may apply for a grant of New Zealand citizenship (see below) after meeting the requirements. Upon this point, they become New Zealand citizens otherwise than by descent and can then pass on New Zealand citizenship to children born outside New Zealand. To receive a grant of New Zealand citizenship, a person must either fulfil the general requirements or qualify for a special grant (e.g. as the child of a New Zealand citizen or as a qualifying Samoan citizen). A person granted New Zealand citizenship must usually attend a citizenship ceremony, unless they are under the age of 14, already a New Zealand citizen by descent or granted citizenship on the basis of birth outside New Zealand to a New Zealand citizen mother. These ceremonies are conducted by local city and district councils at regular intervals, although some new citizens choose to attend a special ceremony, such as those which occur on Waitangi Day (New Zealand's national day, 6 February). At the ceremony, the person must make the oath of allegiance for new citizens before the city or district's mayor (or another presiding officer), unless the Minister of Internal Affairs has waived this requirement. A person who receives a grant of New Zealand citizenship is a New Zealand citizen otherwise than by descent, and so they can pass on New Zealand citizenship to their children born overseas. Time spent outside New Zealand in Crown service under the New Zealand Government (or as the spouse, civil union or de facto partner of a New Zealand citizen in Crown service under the New Zealand Government overseas) may be considered as time spent in New Zealand. Similarly, time spent overseas in the public service of the Government of the Cook Islands, Niue or Tokelau (or as the spouse, civil union or de facto partner who was a New Zealand citizen serving overseas in the public service of Government of the Cook Islands, Niue or Tokelau) can count as time spent in New Zealand. 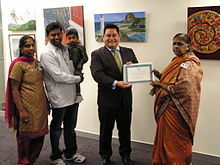 Previously, for applications before 21 April 2010, those present in New Zealand as permanent residents before 21 April 2005, or those who applied successfully for permanent residence before that date, were able to apply for New Zealand citizenship after three years of "ordinary residence" (this provision expired on 1 January 2010). Samoan citizens do not need to meet the residence, intention, character, language and knowledge requirements that a person would generally need to fulfil to qualify for a grant of New Zealand citizenship. Whilst the Citizenship Act 1977 defines 'New Zealand' as New Zealand, the Cook Islands, Niue, the Ross Dependency and Tokelau, the Citizenship (Western Samoa) Act 1982 defines 'New Zealand' to mean New Zealand only. Therefore, to apply for a special grant of New Zealand citizenship for Samoans, presence or indefinite immigration status in the Cook Islands, Niue, Ross Dependency and Tokelau does not count as presence or indefinite immigration status in New Zealand. Additionally, persons born outside New Zealand to or adopted by a mother who was a New Zealand citizen otherwise than by descent on or after 1 January 1949 and on or before 31 December 1977 are entitled to be granted New Zealand citizenship (i.e. the Minister of Internal Affairs cannot refuse the application of a person who qualifies for a grant of New Zealand citizenship in this way). The Minister of Internal Affairs has the discretion to grant New Zealand citizenship to a person who would otherwise be stateless. The Minister of Internal Affairs has the discretion to grant New Zealand citizenship to any person in exceptional circumstances where to do so would be in the public interest. New Zealand has permitted dual or multiple citizenship since the creation of New Zealand citizenship on 1 January 1949, although dual citizens who actively acquired or exercised their other citizenship could lose their New Zealand citizenship if their continued citizenship was judged "not conducive to the public good". The modern wording is similar; dual citizens may lose New Zealand citizenship by acting "in a manner that is contrary to the interests of New Zealand". A New Zealand citizen who holds another citizenship may renounce their New Zealand citizenship (see below), although this may not be registered if they reside in New Zealand or the country is at war. New Zealand citizenship was granted only to British subjects (exceptions could be made for married women and minors); therefore, New Zealanders who lost British subject status before 1949 were not necessarily entitled to automatic New Zealand citizenship and so would have been required to apply for naturalisation. In 2017, dual citizenship with New Zealand proved problematic for multiple Australian politicians, who are ineligible to run for parliament with allegiance to a foreign power under s44(i) of the Australian Constitution. These include New Zealand-born Greens Senator Scott Ludlam, who resigned after discovering that he had not lost his dual citizenship by naturalising in Australia, as well as Deputy Prime Minister and Nationals Leader Barnaby Joyce. His father was born in New Zealand as a British Subject and emigrated to Australia. Living in Australia as a British Subject, he was granted New Zealand citizenship when it was created, thus retrospectively making him a NZ citizen from birth. This subsequently made Joyce a citizen by descent. The Minister of Internal Affairs may refuse to register the renunciation of New Zealand citizenship of a person if they are living in New Zealand or if a state of war exists between New Zealand and another country. The general practice is that if a New Zealand citizen is in New Zealand at the time of applying to renounce their citizenship, the Minister of Internal Affairs will only register the renunciation if the person would continue to reside in New Zealand lawfully following the renunciation (e.g. if they are also an Australian citizen or has a residence permit) or if the person will leave New Zealand permanently following the registration of the renunciation. A person may become caught in a ‘catch-22’ situation: if they want to become a citizen of their new country, but cannot until they have renounced their existing citizenship, they are unable to renounce their New Zealand citizenship and the Minister of Internal Affairs will not register the renunciation of their New Zealand citizenship, because the law specifies that a person must already have the citizenship of at least one other country at the time of applying for renunciation of New Zealand citizenship. Therefore, for example, an individual who only has New Zealand citizenship will never be able to apply for Singaporean citizenship because once her Singaporean citizenship application has been approved, she must first renounce her existing nationality before she can attend a Singaporean citizenship ceremony and officially obtain Singaporean nationality. A register of people who have renounced or have been deprived of New Zealand citizenship is kept by the Citizenship Office and any person is allowed to view it. The nationality laws of Israel, Canada, the US (e.g. see List of denaturalized former citizens of the United States), UK and Spain have provisions to take away the locally acquired citizenship if it was obtained under a process similar to the one mentioned above for NZ nationality acquired via naturalization. A New Zealand citizen by birth does not lose their citizenship by being adopted by a foreign parent/parents. In 2011, 19,279 people from 185 countries obtained New Zealand citizenship by grant. Between 1970 and 2011, the top 10 previous citizenships of people who obtained New Zealand citizenship by grant were (in order starting from the most): the United Kingdom, China (including Hong Kong and Macao), Samoa, India, South Africa, Fiji, Taiwan, Korea (North and South), the Philippines and Sri Lanka. Prior to 1 January 1978, New Zealand citizenship law had different rules. persons from non-Commonwealth countries had to become naturalised. This required five years residence, including a requirement for notice to be given 12 months before application. women married to New Zealand citizens were permitted to become New Zealand citizens as of right, without a residence requirement, if a citizen of a Commonwealth nation or the Republic of Ireland. Where the woman was from a non-Commonwealth nation, registration was allowed at the discretion of the Minister of Internal Affairs. New Zealand citizenship by descent could be obtained only from a father, not the mother (however those born between 1949 and 1977 to a New Zealand mother may be able to register now as New Zealand citizens). Where the father was a New Zealand citizen by descent, the child normally had to be registered as a New Zealand citizen before age 16. ^ Levine, Stephen (2006). New Zealand as it Might Have Been. Victoria University Press. p. 53. ISBN 978-0-86473-545-4. ^ Rashbrooke, Max (2013). Inequality: A New Zealand Crisis. Bridget Williams Books. p. 92. ISBN 978-1-927131-51-0. ^ So'o, Asofou (Spring 2004). "Samoa". The Contemporary Pacific. 16 (1): 163–166. doi:10.1353/cp.2004.0030. Retrieved 14 March 2007. ^ Grant of citizenship by reason of parent a citizen by descent Archived 14 February 2013 at the Wayback Machine, dia.govt.nz. ^ Grant of citizenship by reason of exceptional circumstances and public interest Archived 14 February 2013 at the Wayback Machine, dia.govt.nz. ^ British Nationality and New Zealand Citizenship Act 1948, section 22. Retrieved 29 September 2010. ^ Strutt, J; Kagi, J (14 July 2017). "Greens senator Scott Ludlam resigns over failure to renounce dual citizenship". abc.net.au. ^ Gartrell, Adam; Remeikis, Amy (14 August 2017). "Deputy Prime Minister Barnaby Joyce refers himself to High Court over potential dual citizenship". The Sydney Morning Herald. Retrieved 14 August 2017. ^ "Give up your New Zealand citizenship". Department of Internal Affairs. Retrieved 21 March 2015. ^ "ICA - Citizenship Approval". Archived from the original on 18 July 2017. Retrieved 7 October 2011. This page was last edited on 19 September 2018, at 21:20 (UTC).